If your pet ingested something and then immediately shows signs of choking, open the mouth, pull out the tongue if necessary, and examine the airway for obstructions you may be able to swipe out with a finger. 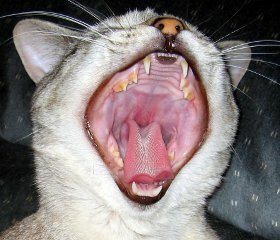 Do not blindly place your hand down your pet’s throat and pull any object you feel. A dog’s Adam’s Apple is at the base of its tongue, and it feels like a small bone. Owners probing the throat for a foreign object have mistaken these for chicken bones. Do not attempt to remove an object unless you can see and identify it. Also, remember that gasping for breath is a symptom of many other conditions, such as heart failure, so be sure your pet is choking before you give the Heimlich. If sweeping the mouth doesn’t help, and your pet is definitely choking on something, follow the steps below to perform the Heimlich maneuver. Hold your pet upside down with its back against your chest. For large dogs, stand facing the dog’s head and lift up its back legs, so the dog is upside down with its back against your chest and its front legs on the ground. Hugging with both arms, give five sharp thrusts to the cranial abdomen area, doing each one like it would be the one to expel the object. For larger pets, instead of a hug, make a fist with one hand and cover it with the other. 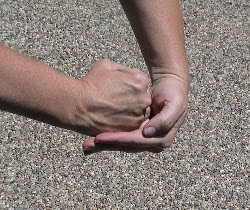 Use this fortified fist to thrust upward into the abdomen. Stop and check in the mouth and throat for the object. If you see it, remove it and give two rescue breaths (see Artificial Resuscitation). Be careful of what looks like a small bone at the back of a dog’s tongue, which is the Adam’s Apple. Do not proceed with CPR until the airway is clear, even if the animal goes into cardiac arrest. There are modified versions of this technique. Some people, for instance, perform the Heimlich on an animal the same way they would on a person, in other words, with the animal upright instead of upside down. Holding the animal upside down, though, adds force to the expulsion attempt.